Wandsworth Council is putting on a series of Public Exhibitions to breathe new life into The Nine Elms Cycle Bridge which many had thought to be dead in the water after failing to gain any support from The Mayor of London and following Westminster City Council’s stinging examination of the proposition. Exhibitions explaining the project are being held on both sides of the river to update local residents on the status of the project and the work that is currently being undertaken and to give them the opportunity to explore the project in more detail, ask questions and provide feedback at this early stage. Here are some Nine Elms Cycle Bridge Talking Points that have emerged from a closer look at the proposal which seems still to be based on a 2013 speculative study by TfL. ‘The longest stretch of riverbank in central London without a crossing point…’ This only works by defining ‘central’ to fit the premise; choosing Chelsea-Wapping or Pimlico-Tower give different answers. Besides, expensive infrastructure money should go where it’s most needed, not to even out spaces on a map. More strategically important would be the stretch from Tower Bridge to Rotherhide and beyond. ‘The regeneration of Nine Elms will provide £26 million in private funding for this scheme…’ No details given. Total cost probably more like £60-90m, leaving the probable bulk of the project unfunded. Nine Elms has quietly slashed their affordable housing obligations to make the regeneration scheme more viable so it seems highly unlikely that even the £26m will materialise in reality. ‘…and London’s very serious pollution problem demands that we develop clean and sustainable infrastructure wherever its business case is proved.’ The TfL Feasibility Study showed modest benefits based upon optimistic trip diversion guesstimates (see 5.1). They calculated the whole business case upon the unfounded assumption that 44% cycle and 26% pedestrian trips would switch to the cycle bridge from other bridges or routes. That seemed over-optimistic in 2013 but the subsequent creation of the adjacent Cycle Superhighways make Wandsworth’s continued claims more than puzzling. TfL explained to a Westminster Scrutiny Committee that the 2013 feasibility study was more of a proof of concept, limited in scope, did not address the Bridge’s integration into London’s Transport system, and did not include any impact assessment. TfL said they had done no work on the Bridge since and Wandsworth hadn’t asked them to proceed further. ‘…and as our city’s growth continues we must provide the new transport infrastructure to meet rising demand.’ The scant data made available shows that a cycle bridge would do little for London’s transport demand. Trip times we estimated using Google Maps gave reductions measured in seconds rather than minutes and some trips could take longer. The twisty bridge geometry doesn’t help. It’s not a part of London that would benefit greatly compared to many other areas. 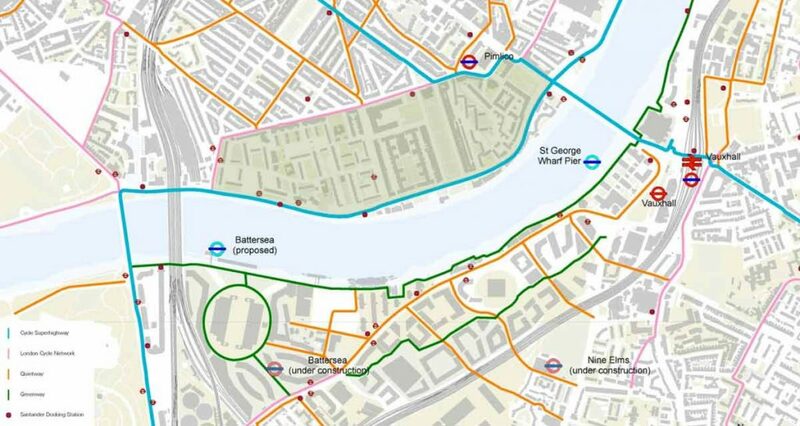 The Bridge’s Northbound trajectory runs straight into dense residential blocks of Churchill, Dolphin Square and St George’s Square, so cyclists would have to detour towards Vauxhall Bridge or Chelsea Bridge anyway. The bridge’s complex and expensive geometry is due to lack of landing space. Not just on the already developed Pimlico side. Tellingly, no provision has ever been made by Wandsworth or Nine Elms developers for wiggle-room on the South side. ‘According to a TfL feasibility study, the project would ‘pay for itself twice over in terms of reduced journey times and other benefits’. I can’t find the actual details of this calculation anywhere, just a faulty 2:1 cost benefit being quoted without any evidence or context. A study modelling projected flows and economic benefits concluded that the Wandsworth-favoured alignment (US Embassy) was a relatively poor performer. The timing of the exhibition announcement coincides with the news that Wandsworth and Nine Elms has slashed affordable housing from a very modest 15% down to only 9%. It will also move them to a less salubrious part of the development. The loss of so many dwellings is due to reduction in expected profits by the corporations developing the site. It’s entirely possible that The Nine Elms Cycle Bridge is simply a brilliant marketing and PR tool that has generated huge amounts of editorial coverage for free. It costs peanuts and I’m afraid that we are the monkeys. Wandsworth and The Nine Elms Development team should seriously consider using the £26 million bridge money to provide truly affordable housing in the development zone. It might help to restore some of the tarnished reputations of both the Council and their development partners. Please share your responses to this exhibition with us – Wandsworth and its project partners may need to accentuate the positive – tell us in the comments below or via the Contact page. If we hosted our own Bridge feedback form, would you use it? View more posts on this site about The Nine Elms Pimlico Bridge. Nine Elms Pimlico Cycle Bridge on Twitter. OMA: We were serious, but the Nine Elms contest wasn’t. 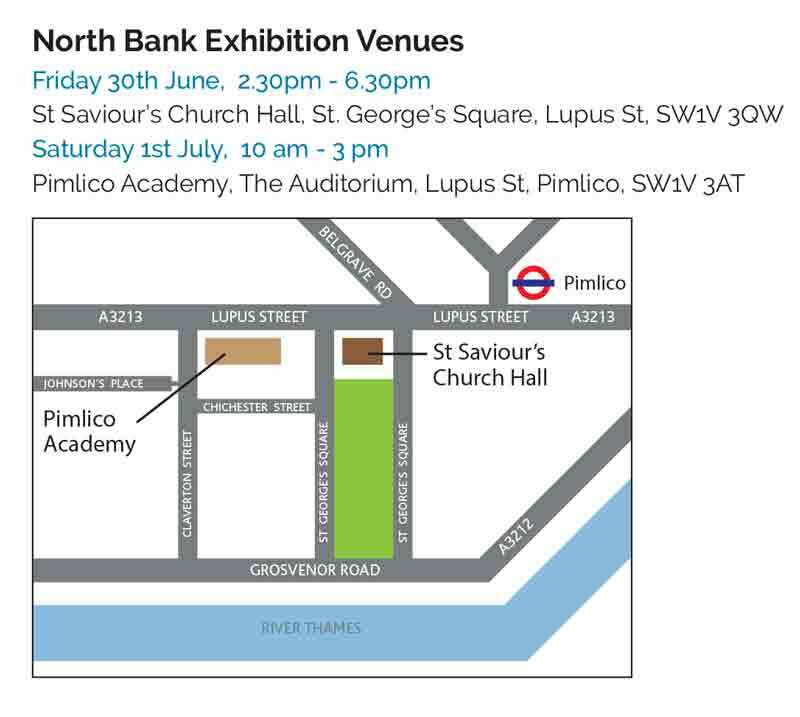 Directions to the Nine Elms Cycle Bridge Exhibitions, June-July 2017. Click image for PDF. The Bridge Project Team has been contacted for fact-checking and clarification. This article will be updated when they respond. Please revisit this page or join the mailing list. Separator image Posted in Event, Transport and tagged with bridge, campaign, cycle, nine elms, transport. I am confused about these dates. Are we talking 2017? July 31st is a Monday, not a Friday. This is unclear. Yup, it’s Monday not Friday. Sorry!